For a more specific delivery time please do email me to find out how long an order might take. It all depends on what I have in stock; all the blankets are made to order so if I have the wool in stock it might be a week and if I need to order the wool in it might take up to 3 weeks (particularly at Christmas) I try to keep all Christmas lines in stock year round and as many of the cushions as possible unless it's a custom colour cushion. If you need your chunky knit ASAP for any reason please do get in touch before ordering to check it's possible and I will do everything I can to get it out to you in time. I use a super soft, and hypoallergenic Merino wool (which I firmly believe is the worlds greatest material, you can see why here) The wool has been washed and carded so it's lovely, clean and cozy by the time it gets to me. Then, I treat it myself by hand to make each piece as durable as possible whilst keeping it's amazing, natural tactility. Yes, there's 2 sides to my business - Ready made items that I have knit/knit to order and the DIY section when you can have a go at giant knitting yourself. - I sell both the wool by itself as well as 'Knit Kits' which include the wool, needles and pattern for you to knit your own throw! At the moment there's only an 'experienced knitter' kit (you only need to know the basics) but i'm working on a kit for beginners. For the blankets I use 40mm Knitting needles which are available here. I had mine specially made when I first started as there was nothing that size available. For the footstools and cushions, I use large wooden needles that were hand-made for me. As you can imagine, it gets very heavy as each throw gets going. Forget the gym - Knitting is the new workout! How long does each throw take you? Excluding drying time, a small throw takes approximately 1 day and a large throw about 2 days. Yes, I've recently enabled international shipping on my website (you can read more about it here) and I also sell internationally on Etsy. UK orders are free delivery and international orders are charged at cost. I don't look to make any money on them, I look for the best value shipping options. How do I know if Giant knitting's for me? 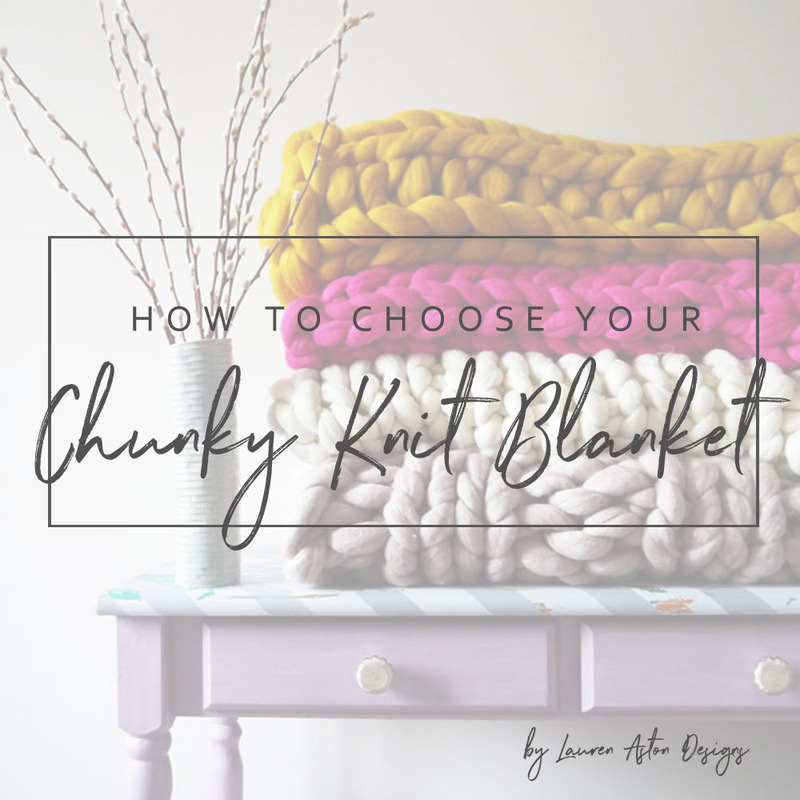 I've done a blog post about the pros and con's of giant knittingwhich will hopefully help you decide. Giant knitting isn't for everyone and let's face it, the wool isn't particularly cheap so it's important to know what you're getting into before you purchase. How much wool do I need to make a blanket? Can you wash your products? Please see the Care Instructions for full care details but, essentially, spot clean any spills and dry clean only when necessary. Do you do other colours and sizes? Yes! I can get my hands on over 100 colours and as every item is hand made by me or my small team I can easily make other sizes. You can check out the Bespoke section for more info. What Size Blanket should I buy? 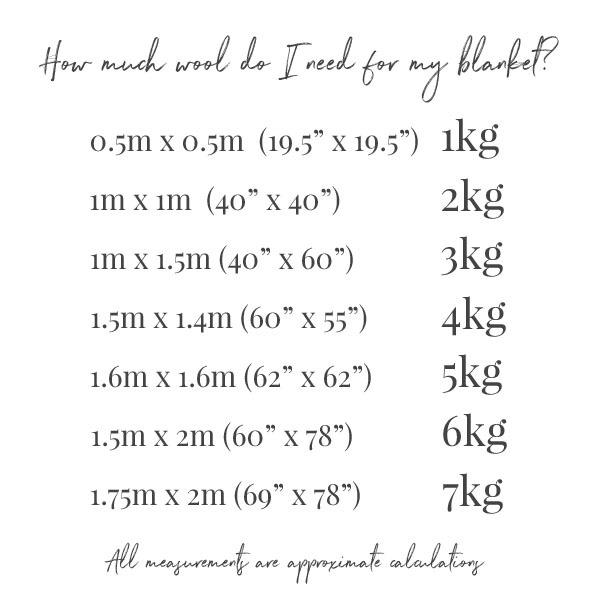 I have 5 different sized blankets and each is good for different things, I've done a more in-depth blog post about it with lots of pictures so that might help you decide. If you have any other questions that haven't been answered here please do feel free to get in touch and I'll get back to you ASAP. Thank you!